The Maker Faire is like a giant science fair mixed with a craft fair and all the strangest, most interesting projects people can think of are on display. It began in 2006 in California, and unfortunately it occurred the week after I returned to New York from being trained in California. It continued to occur annually and even expanded to Austin, Texas over time. This year, they brought it to Detroit and will be in New York on September 24 and 25. As soon a it was announced, I jumped at the chance to display some Lego projects with my fellow New York Brick Artists. I am excited beyond belief to see what people create and to display projects such as the TARDIS and the Green Lantern Power Battery. Touristbot will also be in attendance to give a table’s eye view of the event. 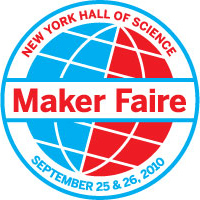 I hope everyone comes out to see the Maker Faire, where they expect 5-600 Makers displaying their arts to several thousand attendees. And if you do attend, please stop by my table and say hi.